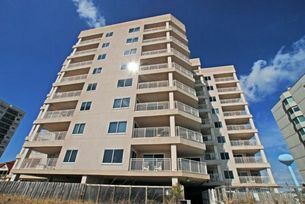 What better way to spend your summer vacation than at an oceanfront condominium in North Myrtle Beach, South Carolina. There are many reasons your family will love a North Myrtle Beach vacation at Xanadu II: charming two- and three-bedroom North Myrtle Beach condominiums, oceanfront views and close proximity to North Myrtle Beach attractions are but a few of them. Nicely decorated and beautifully equipped, the oceanfront North Myrtle Beach condominium rentals at Xanadu II feature a full kitchen with a dishwasher, furnished balcony with breathtaking ocean views and comfortable accommodations for at least six people. Everything you need is at your fingertips when your North Myrtle Beach vacation includes reservations at the oceanfront Xanadu II North Myrtle Beach resort. Bask in the sun all day with a sparkling blue swimming pool at this North Myrtle Beach resort. Take your beach chair to the very edge of the water and let your feet get wet with every incoming wave. This is the best way to read a book on your North Myrtle Beach vacation. Retreat to your North Myrtle Beach vacation condo where enjoying cocktails on the balcony is the perfect way to end your North Myrtle Beach vacation day. And do not forget to begin at least one vacation day in North Myrtle Beach, South Carolina sitting on the beachfront watching the morning sun rise over the watery horizon. It is a beautiful display of color and a memorable part of all East Coast beach vacations. From this North Myrtle Beach vacation destination, the most popular North Myrtle Beach attractions are only minutes away. Around the corner at Barefoot Landing, your family can enjoy waterfront dining, plenty of charming shops in which you are sure to find the perfect memento of your North Myrtle Beach vacation, and live theatre entertainment at House of Blues and Alabama Theatre. From water parks and amusement rides to championship golf courses and Sea Doo rentals in the ocean, North Myrtle Beach is brimming with fun and exciting activities for your whole family to enjoy during your next North Myrtle Beach vacation at Xanadu II. Make your reservations for these oceanfront accommodations today. Elliott Beach Rentals is not affiliated with onsite management or the HOA of Xanadu Ii.